Which Fruits Contain a Lot of Sugar? There are a variety of reasons to be concerned about the sugar content in the food you eat. Diabetics need to meticulously monitor their sugar intake while athletes might need foods high in sugar during and after a workout to help bolster their energy for a long endurance event. The primary source of sugar in fruits is fructose, which is a natural sugar. Raisins, which are made by dehydrating grapes, contain a significant amount of sugar for their size. 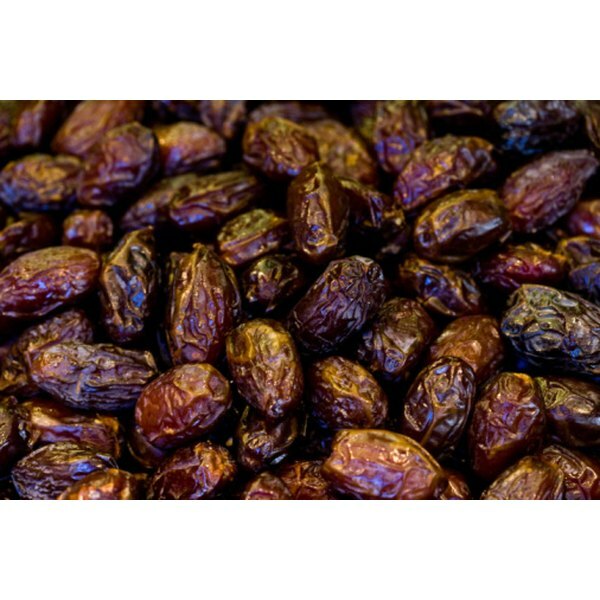 The process of removing the water condenses the sugar content, packing each raisin with sugar. One-quarter cup of raisins contains about 130 calories, with almost all of them coming from sugar. It equals about 29 g of sugar. Raisins also contain 310 mg of potassium. One medium-size orange contains about 12 g of sugar and 70 total calories. Oranges contain 269 mg of potassium and significantly more water content than raisins. Oranges also contain the full recommended daily amount of vitamin C.
Fructose is broken down differently than simple sugars and is a better choice for diabetics. Raisins have a glycemic value of 64, while oranges have a value of 43. The higher the value, the more quickly the sugar enters the bloodstream. The potassium in each helps prevent cramping, according to Colorado State University. Although both fruits contain high amounts of sugar, selection depends on the reasons for eating it. Diabetics need to factor in the sugar content and glycemic values of their fruit choice in conjunction with their other meals to ensure their blood-sugar level remains balanced. If a lower glycemic value fruit is required, oranges are the better choice; however, if a higher GI value fruit is needed, raisins are a better choice. Athletes have different factors to consider when choosing fruit. Oranges have higher water content than raisins, though both contain ample amounts of sugar. During exercise, adequate hydration is needed; therefore, ingestion of oranges can help supply energy over long endurance events while also supplementing water needs. After an event, the body needs to recover its sugar stores as quickly as possible. In this instance, raisins, with their higher GI value, would be a more prudent choice than oranges.